Scanner search in real-time for financial instruments which meet a set of criteria defined by the trader. 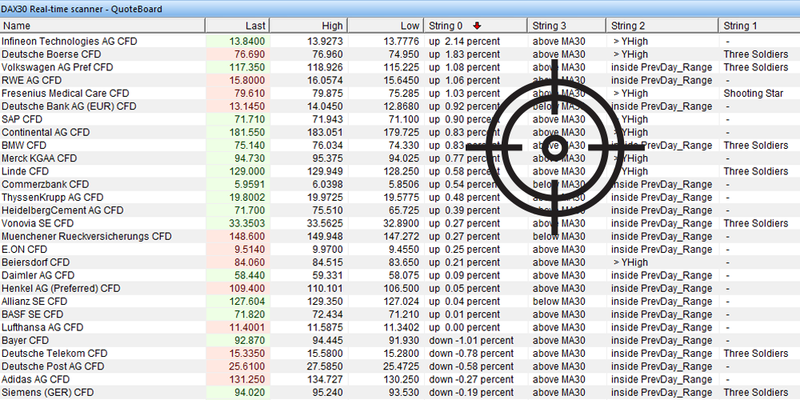 The NanoTrader simply allows the trader to convert his basic watch list into a powerful scanner. scan an unlimited number of instruments in real-time. easily define his criteria and insert them in the quoteboard which thus becomes a scanner. scan for different criteria within the same quoteboard. scan the same instrument with different sets of criteria. attach different alert types (e-mail, sound, pop-up) to the scans. place his orders directly from the scan. Traders can either define their own candlestick patterns in the NanoTrader or use the pre-configured candlestick patterns. In this example the NanoTrader has alerted the trader of 4 stocks which display a candlestick pattern. The NanoTrader contains more than 60 free trading strategies and signals many designed by famous traders. In this example the trader is using some of the built-in strategies to find trading opportunities. Traders can place their order directly from the scanner table. Even if the trader does not open a position based on the last signal, the NanoTrader will simulate a position. This useful feature allows the trader to gauge the quality of a signal. Some traders will not open a position when a signal appears but only later, when it appears that a signal/position evolves in the right direction. This is another advantage of the simulated positions. The NanoTrader quoteboard function can be used as a normal “watch list” or can be easily upgraded to a real-time market scanner. In addition to the making their own scanners, traders can use the free built-in scanners, including the NanoTrader’s famous trend scanner.